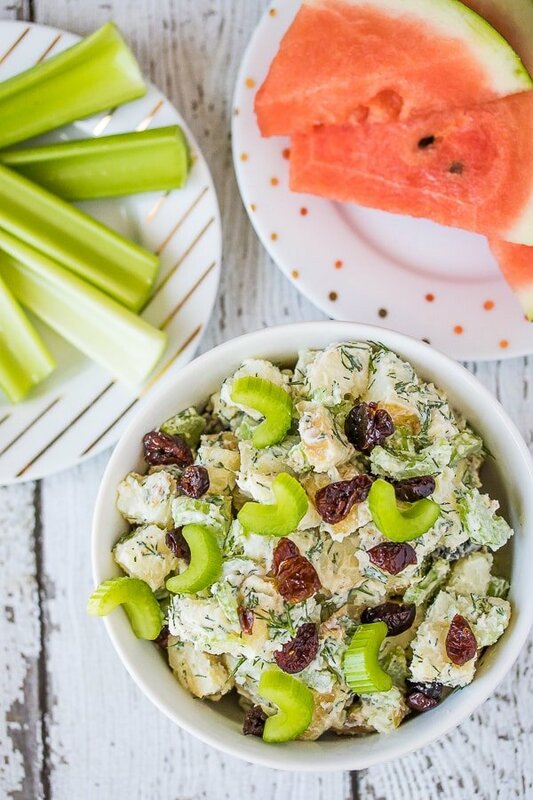 This Easy Instant Pot Potato Salad is perfect for a quick summer side dish. This dairy-free recipe has only 5 ingredients, but it’s full of flavor and texture. I love hearing how Memorial Day is the unofficial start of summer; it makes me so much happier than when Labor day rolls around and it’s the unofficial end of summer! Since I’ve been working very hard to manage my stress better, summer is the perfect time for me to practice some new habits. Warmer weather and longer days get me out into nature more which is so good for my soul (here are some pictures if you’re curious to see where I live). Back to this salad. Having more go-to easy recipes is definitely part of my stress management. The Instant Pot pressure cooker has become one of my favorite kitchen appliances just in the last 6 months or so. I have two, but I use this one the most. Pressure-cooking works amazing for potatoes! I made this Easy Sweet Potato Mash here. 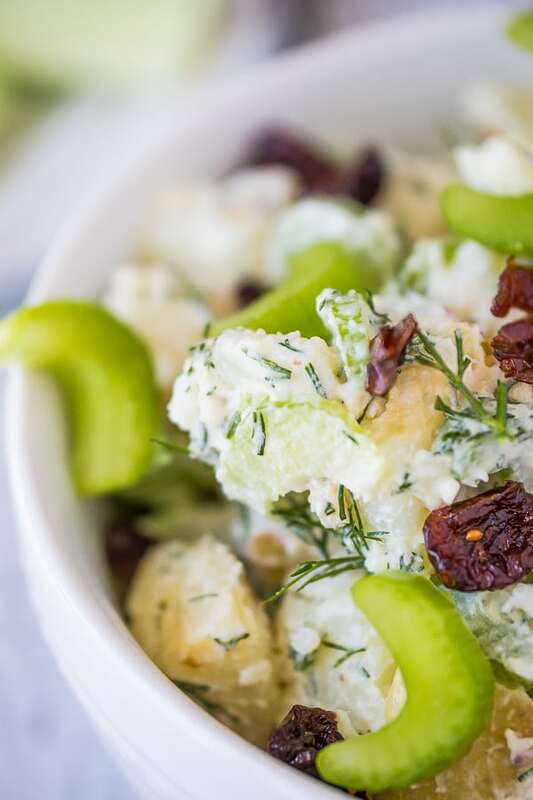 For this Potato Salad recipe, I used medium-sized white potatoes. They get washed and pricked with a fork and placed on the trivet that comes with the Instant Pot. This will make sure they don’t get water-logged or mushy. Potatoes cooked this way only need 12 minutes at pressure to be cooked perfectly. 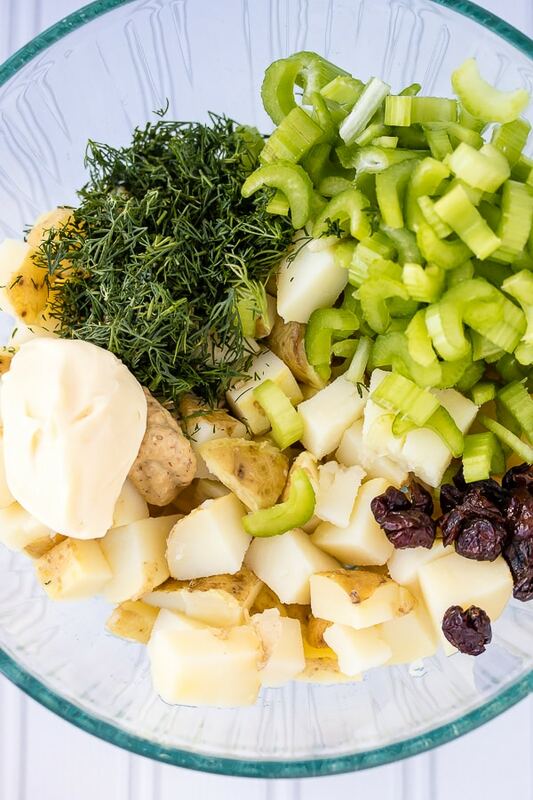 Then, to transform them into an awesome potato salad, you just need to dunk them in cold water, chop them, and toss them with 4 other simple ingredients: mustard, mayo, fresh dill, and chopped celery! 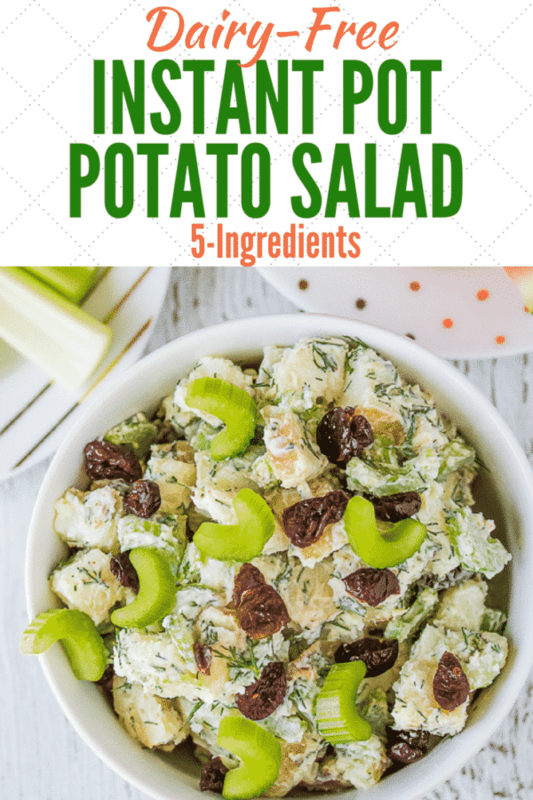 Summer holidays, potlucks, barbecues, and parties would all benefit from a quick and easy potato salad. The apple juice-sweetened dried cranberries are optional for this recipe, but I like the sweet to balance the mustard and mayo. Alan told me his mom’s secret for adding sweetness was to use some sweet pickle juice which also sounds like a really great idea and a total throwback! An easy side dish made dairy-free and using a pressure cooker. Scrub the white potatoes and dry them gently with a clean towel. Use a fork to prick each potato all around, about 8 pricks per potato. Then, place the trivet inside an 8-quart pressure cooker with 1 cup of water. Place the potatoes on top of the trivet and lock on the lid. Cook at high pressure for 12 minutes. Once the cooking is done, release the pressure or let it come down naturally. Carefully remove the lid on the pressure cooker. 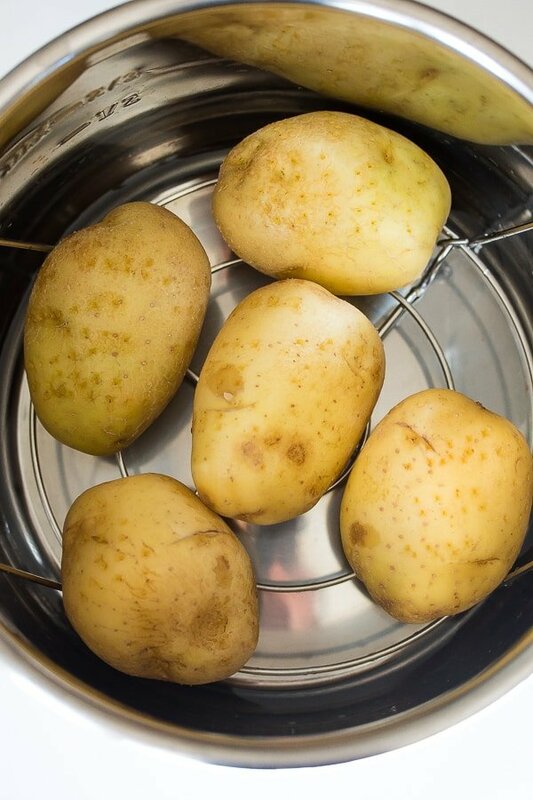 Place the potatoes in an ice-water bath to cool them. Remove them and dry them with a clean towel. 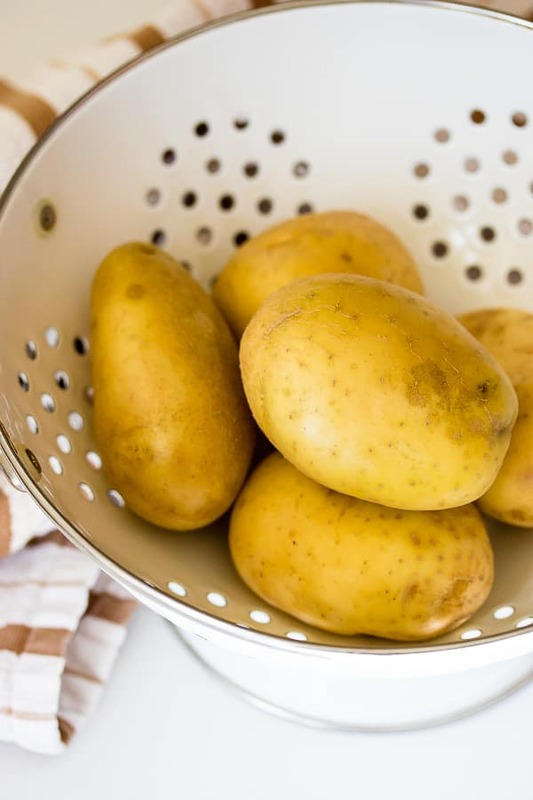 Chop the cooled potatoes into bite-sized chunks and place them in a large mixing bowl. Add the mustard, mayonnaise, fresh dill, and chopped celery and use a spatula to mix together. 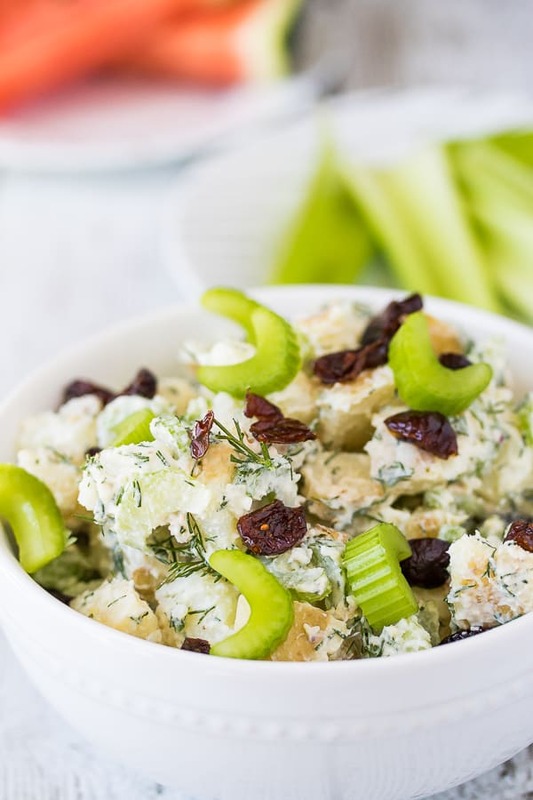 Serve the potato salad with cranberries, if desired. Season with salt and pepper, to taste. The potato salad will last up to 5 days in the refrigerator. I love my instant pot. I need to figure out where I put that trivet – I haven’t tried potatoes yet! Thanks, Marcia! Oh yeah, you need to track down the trivet! I have yet to jump on the Instant pot train because I’ve heard such mixed reviews but recipes like this one really make me want one! Looks yummy! Tiffany, it took me awhile to get used to cooking with the InstantPot. But, once you get the hang of it, it’s indispensable!!! 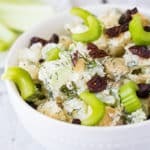 One of my favorite EASY summer recipes!